I won't describe what I look like. Whatever you're thinking, it's probably worse. August (Auggie) Pullman was born with a facial deformity that prevented him from going to a mainstream school--until now. He's about to start 5th grade at Beecher Prep, and if you've ever been the new kid then you know how hard that can be. The thing is Auggie's just an ordinary kid, with an extraordinary face. But can he convince his new classmates that he's just like them, despite appearances? R. J. Palacio has written a spare, warm, uplifting story that will have readers laughing one minute and wiping away tears the next. 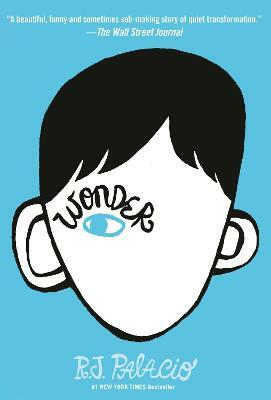 With wonderfully realistic family interactions (flawed, but loving), lively school scenes, and short chapters, Wonder is accessible to readers of all levels. R. J. PALACIO lives in NYC with her husband, two sons, and two dogs. For more than twenty years, she was an art director and graphic designer, designing book jackets for other people while waiting for the perfect time in her life to start writing her own novel. But one day several years ago, a chance encounter with an extraordinary child in front of an ice cream store made R. J. realize that the perfect time to write that novel had finally come. Wonder is her first novel. She did not design the cover, but she sure does love it. Learn more about R.J. Palacio and the world of Wonder at wonderthebook.com.